Diageo has launched a new marketing push for Johnnie Walker – the largest in the brand’s history – in a bid to drive sales for the next decade. The “Joy Will Take You Further” campaign is an extension of the brand’s long-running “Keep Walking” campaign, which first launched in 1999. Said by Diageo CEO Ivan Menezes to “define the next era” of the Scotch whisky industry, the campaign launched in 50 countries simultaneously yesterday (16 September) – the first time the group has launched a single marketing activation in so many countries at the same time. The campaign will reach nearly 270 million consumers around the world within the first few weeks of its launch, equal to 75% of Johnnie Walker’s domestic business. It will launch in global travel retail channels in late October 2015, by which time “Joy Will Take You Further” would have reached 90% of the brand’s domestic business. Described as a “new perspective on personal progress”, the campaign centres around the idea that joy can act as a catalyst for success and was developed in partnership with the brand’s global creative agency, Anomaly. It brings together some of Johnnie Walker’s most famous brand ambassadors, including actor Jude Law and Formula One star Jensen Button, and a number of new ambassadors, such as Swedish engineer Eva Hakansson and artistic duo Haas and Hahn. The ambassadors all feature in the campaign’s first advertisement (view below). “The launch of Keep Walking marked a fundamental shift in the way Scotch was marketed and kick started a decade of transformational growth for both Johnnie Walker and the category as a whole,” said Syl Saller, chief marketing officer at Diageo. “I am hugely excited about the potential of this new campaign to drive Johnnie Walker forward to the next decade of growth. It is rooted in deep consumer insight and tells true stories of people who have truly walked with joy. Drawing on “decades” worth of consumer research, the campaign has been launched as Johnnie Walker’s sales hit a four-year low. In 2014, the brand experienced an 11% drop in sales to 17.9m cases and continued to miss out on the world’s largest whisky brand title, which has been held by Indian label Officer’s Choice since 2013. Guy Escolme, Johnnie Walker global brand director, added: “Recent trading conditions have been difficult, but the future looks bright and there’s still huge recruitment opportunities around the world. We believe we can grow Johnnie Walker in a way that’s successful. “Keep Walking and the idea of progress have proven to be very recruitment assets. The one area we thought needed more attention was the changing consumer landscape. Diageo also revealed that the second “Gentlemen’s Wager” 10-minute short film for Johnnie Walker, starring Jude Law, will be debuted in October at the Rome Film Festival. 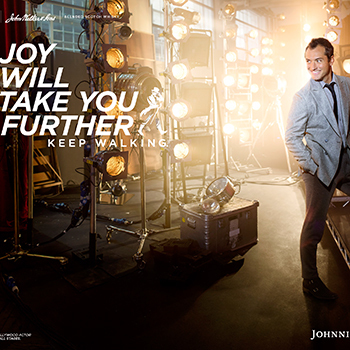 Click on the link below to view the fill advertisement for Johnnie Walker’s “Joy Will Take You Further” campaign.